Blue Raider fans cheer at the unveiling of Murphy Center’s new C-USA banner during halftime of the Jan. 26, 2013 men’s basketball. 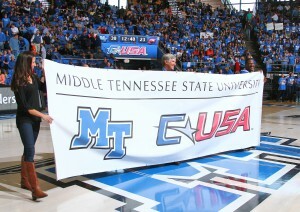 MTSU’s recent invitation to join Conference USA for intercollegiate athletics, beginning July 1, 2013, clearly elevates the standing, competitiveness, and stature of the University’s athletics program. C-USA teams and athletes have made nearly 700 NCAA championship appearances since the league’s inception in 1995. “We have been a proud member of the Sun Belt Conference and we appreciate our years as a member of the league,” said president Sidney A. McPhee. Here is a top-10 list of reasons why MTSU’s jump to C-USA was a good one: A bigger piece of the pie: C-USA members enjoy significant national and regional television exposure and revenue sharing through partnerships with CBS Sports, Fox Sports, and ESPN. Brand expansion: Beyond TV visibility, the conference’s expanded geographic footprint and already established brand enhances MTSU’s chances of becoming a household name. Student-centeredness: The move provides MTSU student-athletes with bigger stages, bigger challenges, and bigger opportunities and also gives MTSU more identifiable opponents, rich in athletic tradition. Reaching goals: Joining a more established conference matches a primary thrust of MTSU’s current $80 million fundraising campaign—to gain national recognition for the prowess of its athletes and the quality of its sports programs. Survival of the fittest: In the rapidly reshuffling collegiate athletics landscape, which could one day lead to “super-conferences” that determine athletic championships, schools like MTSU must act aggressively to realign or risk being left behind. 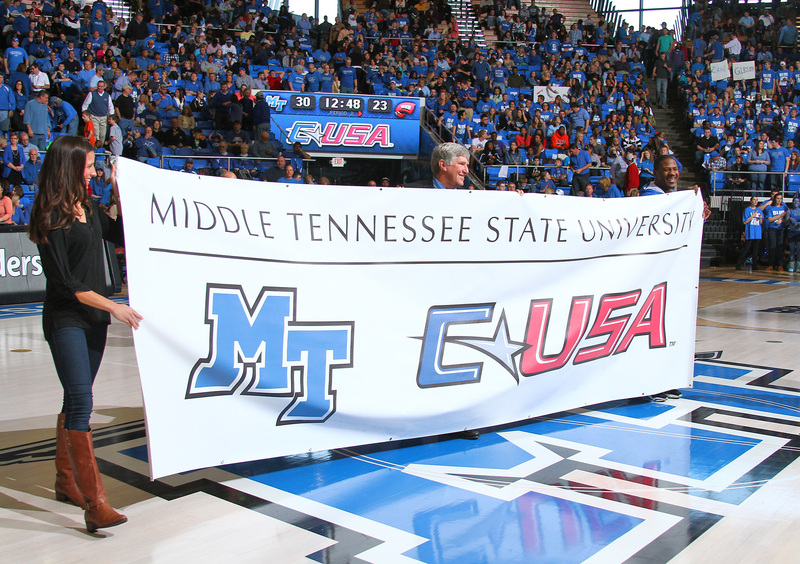 Validation: The C-USA invitation validates the hard work and progress MTSU has made over the past decade both athletically and academically. Conferences look at a lot more than just athletics when choosing new partner institutions, and for MTSU to be joining a conference that includes Rice University—a top academic institution nationally—is a signal of quality. Student recruitment: The move greatly increases MTSU’s ability to recruit better athletes on the promise of established bowl game tie-ins, bigger venues in which to play, and a higher level of competition. Perfect match: MTSU adds value to Conference USA, specifically through exposure in the Nashville TV market at a time when the conference has recently lost markets in Houston, Memphis, New Orleans, Dallas, and Orlando. More support: The added prestige, visibility, and increased fan interest makes MTSU more attractive for corporate sponsorship. The move should also motivate more giving from boosters, who have wanted something like this to happen for a long time. Some Blue Raider supporters who haven’t yet given monetarily may be inspired to get off the sidelines. New rivalries: Consider that just a few years ago, there was no rivalry between MTSU and Troy. C-USA members such as the University of Alabama–Birmingham (UAB), Marshall, and Charlotte seem to be natural regional foes.